Summary: A stroll down memory lane and a film I’d be happy to show the grandkids. Future Movies takes a look back at one of the all time classic kids movies of the 80’s… Think shocking bandannas and sweat bands, think high top-trainers, think Cyndi Lauper on MTV… It’s The Goonies! When a friend e-mailed me to say that our local multiplex, not normally known for it’s adventurous movie scheduling, was kicking off 80s revival night on Mondays with The Goonies I virtually moon-walked up the wall. Bleary eyed with memories of the impact this seminal classic had on me in my youth, I reminisced about misspent Saturday mornings watching it on a worn out videotape (that may still exist somewhere in my house!) sitting cross-legged, approximately five inches from the screen. It’s not being over melodramatic to suggest that my obsession with movies probably began with this Spielberg-originated sprinkle of saccharine. It was one of those comfort blanket films (we all have them) I would watch over and over again; studying every scene, memorising every line… getting the truffle shuffle down pat. In my mind at least, a seat at the head table of great 80s movies was always assured for The Goonies. Alongside such staples as Beverly Hills Cop, Ghostbusters and anything starring Michael J Fox, The Goonies it’s part of what defined an era and informed a young man’s dreams. As we move through life experience can distance us from the things we used to love. To illustrate how far I’ve progressed, My knees now ache when I sit cross-legged, my eyes burn when I stare too closely at a TV screen and, as a man in his mid-twenties, I don’t generally make a point of watching kids films (Pixar not withstanding). So the real question that was filling me with trepidation was how would The Goonies hold up after all these years? Despite the print being dirty and scratched (it looked like it had been run through a sand pit) the gags, the gadgets and the wholesome family fun is all still there, and the whole thing zips along at a corking pace! For anyone who needs a reminder about the story, it’s basically Indiana Jones for pre-teens. 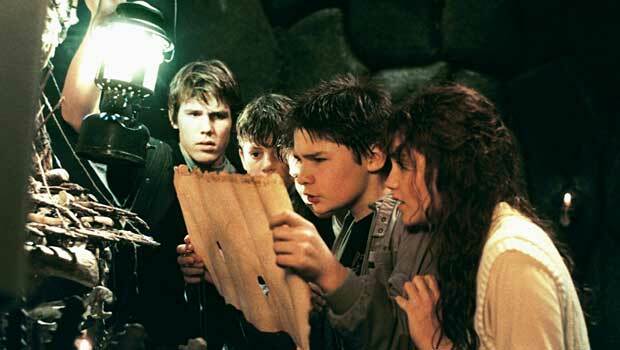 A bunch of kids, led by a diminutive Sean Astin (Sam the Hobbit in Lord of the Rings) let their overactive imaginations run riot when they find an antique treasure map. Suggesting that a mythical pirate’s booty stash might be located just around the next cliff the Goonies (think the bash street kids transferred to New England) follow the map in order that they might be able to save their hard-up coastal community from being turned into a golf course. Of course the map leads them through all sorts of perilous near misses including underground caves, booby-trapped mineshafts and into the hands of a family of Italian mobsters led by vicious matriarch Mama Fratelli (played by possibly the most crone-like actress to ever grace the silver screen, Anne Ramsey). Corey Feldman: who appeared in The Lost Boys and other 80’s staples before he hit the drink and drugs in a big way a la Charlie Sheen. Josh Brolin: He was recently engaged to our own pointy-chinned songbird Minnie Driver and appears in occasional films as the sports-car driving hunk. Martha Plimpton: Bookish tomboy known for playing the occasional grease monkey/ airboat mechanic alongside Tommy Lee Jones. Kerri Green: Anonymous Tiffany look-alike who dusted off her pleated tennis skirt to reprise the role of the teen temptress in “Lucas” 2 years later, alongside Corey Haim. Johnathan Ke Quan: The little Chinese kid from Indiana Jones and The Temple of Doom. Jeff Cohen: By far the most memorable character as Chunk (the fat kid), Cohen traded type-casting for the treadmill, lost some weight and became an entertainment lawyer. Although not directed by the golden boy of the 80’s, The Goonies fits snugly into Spielberg’s archly sentimental worldview. Small town America and the values it instils is portrayed with a dewy-eyed cherish that is evident in almost everything he touches from Jaws to The Terminal. Luckily, some terrific comedy moments temper Spielberg’s whimsical pining, and Richard Donner (who later went on to direct Lethal Weapon) helms the whole thing with a child-like, but not childish, sensibility that is often so lacking in movies of this ilk. A stroll down memory lane and a film I’d be happy to show the grandkids, The Goonies proved to be as much fun on the big screen in 2004 as it was in 1985, if not more so. Fond memories have rarely come with such immediate, heart warming effect, and what’s even better there’s talk of a sequel, reuniting the original cast from amidst lawsuits, rehab, and relative obscurity: Now that would be something to see. Check out www.fast-rewind.com for all the 80s movie action you could ever wish for!